If you are an Amazon Prime member, but not taking advantage of your free Kindle book each month, you're missing out! Around the first of each month, they send me four - usually very different - books to choose from, and I get one on my Kindle for free. In May, I chose The Lioness of Morocco by Julia Drosten, which is scheduled for publication June 1, 2017. Yup - I read it before then. I haven't been following my actual reading challenge list to choose books to read this year, but this one fits the eighth category on the list - a book with multiple authors. I discovered this in the 'About the Author' section on its Amazon page: "Julia Drosten is the pseudonym for a two-person writing team based in Münsterland, Germany." This is their first novel translated and published in English. Isn't that interesting? 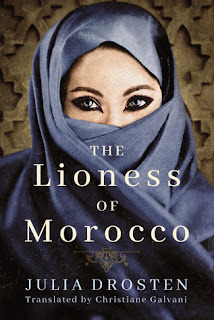 The woman who later became known as the Lioness of Morocco started out as a sheltered girl in London, fast on her way to becoming an old-maid. When at age 23 she recognizes marriage as her best option to get out from under her father's rules, she wastes no time in becoming the wife of an ambitious member of her father's company. Once they take a business assignment in Morocco, she really begins to spread her wings. I really enjoyed this book, as our heroine Sibylla navigates life in a foreign country, raising her family, and substantial changes to her circumstances with bravery and grace. While I tend to not think ahead too much, I did see the surprise twist at the end coming from miles away. But I still enjoyed the journey getting there, and all the details of the story in the interim. I would recommend this book as a great summer read where your mind can take a colorful vacation, even if the rest of you stays at home relaxing for a bit. So glad you wrote about this book. I always take advantage of the free book each month. It's one of my favorite emails I get each year!